We have begun studying To Kill a Mockingbird by Harper Lee. This blog assignment is due by Wednesday, March 20, at 10 PM. As always, please be in touch with Ms. A if you have any questions. Your work is due here by 10 PM on Wednesday, March 20. Please take time to share your best work. Proofread ALOUD to ensure clarity, thoroughness, and accuracy. Your writing must be 250-300 words—minimum. Use strong supporting details from the novel. DEPTH of ideas is far more important than BREADTH. Swim way below the surface of the ocean to the deep part of the iceberg. THINK BIG! WRITE WELL! SUPPORTING DETAILS (not general statements) MATTER MOST! Second, explain one or two deep connections between Lesser’s speech and what you have read so far in To Kill a Mockingbird. (Provide support for your claims.) You may consider a specific motif that both works have in common. 2) Look closely at the endings of Chapters 1-8. Read each of the last paragraphs. Which ending is most interesting and entertaining? Support your selection by discussing its importance to the rest of the novel. In your writing, you can consider how the scene shows character development, how the scene displays an important motif, and how the scene enhances your understanding and enjoyment of the novel. 3) JUSTICE. Discuss how the concept of justice is present and absent in the novel so far. Provide two specific, in-depth examples. 4) WISDOM. Discuss how the concept of wisdom is present and absent in the novel so far. Provide two specific, in-depth examples. 5) Look closely at the photograph “Child and Her Mother,” taken by the famous Depression-era photographer Dorothea Lange in 1939. Explain your response to this photo and make a meaningful, specific connection to the novel. In “Child and Her Mother” I see a girl who is terribly sad and her mother and other people don’t notice. Her mother, in the background, looks like she is calling the child in for dinner or something so innocent. But the girl has a lonely look on her face like she wishes her mother would ask her what’s wrong. It seems like the girl wants her mother and others to notice that she isn’t happy. The girl’s mother is therefore “absent.” Just like in “To Kill a Mockingbird” Dill’s and Burris Ewell’s parents are essentially absent. Dill lives with his aunt in the summer and doesn’t mention his parents much. When Scout asks about his father he says he doesn’t have one. I interpret this as that either his father died when he was young and doesn’t remember or that he left Dill’s family before Dill knew him. So Dill most likely yearns for a father figure just like the girl wants her mother to be more present in her life. As for Burris Ewell his parents are very much alive but they may as well not be because they are barely emotionally present in Burris’s life. Burris is in his third year of first grade because he’s a Ewell and Ewells only come for the first day of school and not the rest. He is also “the most disgusting human” Scout has ever seen. This shows the absence of his parents support because any parent in their right mind would force their kids to go to school. By not doing that to Burris, his parents are basically saying they don’t care. I’m sure Burris, although he has become accustomed to it, like the girl in the picture, wants his parents to care more. I know people who have easy going parents that WISH their parents were stricter. It’s about that sense of people supporting you and encouraging you that both the girl in the picture and characters from “To Kill a Mockingbird” are lacking. Also, the barbed wire indicates some sort of barrier like the Radleys’ white fence in “To Kill a Mockingbird.” The girl not only looks lonely but wanting to go outside the fence. As for the Radleys’ fence, people want to venture inside it to see what goes on in the house. I also feel like the mother doesn’t understand her daughter’s interest in what’s beyond the fence. In “To Kill a Mockingbird” Atticus doesn’t want his kids having any interest in the Radley place. The fences in both cases are holding people back. I chose to interpret about the first option. I picked this because I found it really easy to relate to and understand. The Message in Elizabeth Lesser’s speech really showed and proved to me how sometimes it seems as if government is trying to make us fight against each other. Elizabeth went into detail about this issue and she said one thing. Try something other than what you would normally do. It wouldn’t take that much time… All she asked was to take a lunch and sit down with someone that has different views than you do. She said don’t disagree or interrupt, but LISTEN. See where they are coming from and discus these issues that you think have been dictating the way you think about government and issue related to government. She said that when she sat down with a person from a different views. Elizabeth said that people from her side said that people on the other side were racist and the to her person said the complete opposite, she said that they are with terrorism which is totally unbelievable because that should be the one thing that us as a nation should stick together when it comes up. I can relate this speech that Lesser wrote to “to kill a mocking bird because it shows the different thought that to people can have even if they are your neighbor. This is ironic because Scout and Jem have neighbors that they are not to sure about. This totally goes against everything that Elizabeth Lesser said in her speech. Lesser said to do the complete opposite of what Scout and Jem are doing. The chapter ending that I found most interesting is, Chapter 7. I found this ending most interesting mainly because it was the first time in the story that any of the characters had shown any type of emotion. The chapter ended with Jem crying. In no other place of the book had Jem or Scout let their emotions out, they bottled them up inside. For example, in chapter 3 when Jem stayed in his tree house all day, that was him not letting his emotion out he was hiding from them. Another reason I found this chapter ending interesting is the reason Jem was so upset in the end. Jem was upset because Mr. Radley filled the tree where he and Scout had been getting all of their treasures. Jem might have been upset because he was having fun walking home from school every day find new things. However, it might have been for the better that Mr. Radley filled the hole in the tree because they weren’t sure who all of their treasures were coming from and some of those items could have been harmful to them. An important motif that this chapter ending shows that Jem was use to the pattern of coming home from school every day and looking forward to the excitement about finding something new in the tree. This is a pattern in Jem’s life that has changed and Jem is not comfortable with the change that happened in his life. A lot happened in chapter 7 that had to do with Jem and Scout and having a bond and a regular thing that they do together everyday all of a sudden change. That is why the ending to chapter 7 was so interesting. I chose “child and her mother.” This painting relates to the novel to kill a mockingbird in many ways. This author was painting in the era of the Great Depression as is Harper lee is writing during that time. In the painting this little girl is looking out at the world sad and scared, maybe that is because the lack of a father. The painting is named “child and her mother for a reason. Maybe the child is looking past the barbed wire to see her father. The child isn’t the only lonely one. Scout has no mother and her father is always working as a lawyer. The only time that scout and her father who she refers to as Atticus are really connecting is while she is reading with him. In the painting the barb wire is preventing the child to break free just as scout’s teacher is preventing scout from connecting with her father in the only way she knows how. In the photograph “Child and Her Mother” the most obvious thing that a person looking at the photograph would notice is sadness. The exact reason for it is something that could differ between each person. Some might say that the girl is in trouble and others might say that her mother is very strict and does not want her leaving past the fence. One thing that some people might not notice is that the father is missing. The mother seems to be looking out into the distance as if she is waiting for something or someone. Her daughter seems to be disappointed like she was let down once again. Maybe the father is missing in action and they await to see if he might come this time. You can also easily tell that the times are very hard. The grass is dried out and the fence is just a piece of spiked wire. Its easy to say that something is missing for the family. Not just money but a man of the house. If the father was home he would take care of the grass and try to make it flourish and spread amongst his yard. He would also try to get a nicer looking fence for the front of the house. A connection to To Kill a Mockingbird is that the kids are trapped and their actions are limited. If the kids lived in better times and if they were wealthier than there would be no need for them to go to the house on the corner and try to get in. The chances of a person like Mr. Radley living in a richer neighborhood are very unlikely. There for the kids would not grow up with fear of a ghost living in their neighborhood and it could have changed their whole life of growing up. The kids in the book are also very observing but also sad of Mr. Radley. They want to change the way he lives, and they want to get him to interact with the neighbors and get to know him. In the picture “Child and Her Mother” it makes me feel sad because the little girl is leaning on the fence and is in deep concentration and even her mother, possibly calling her in for dinner or just asking her, “What’s the matter?”, isn’t enough to bring her out of her deep thought. This reminds of Scout because she also has a lot on her mind, such as not being able to read in class. Also, the big open field, that the girl is in, shows how her mind is empty and is just starring off into nothing without a care in the world. Scout is just a little girl with a big imagination and she doesn’t have a care in the world but now she has stress in her life since she entered the first grade. Scout and the little girl are also relatable because they both look around the same age and maybe they have the same problems on their minds. The only difference between Scout and the little girl is that the little girl is ignoring her mother because of her problems. On the other hand, Scout confronted her father about her problems which seemed to help her realize how to deal with her problems and how to make them better. Another aspect to look at this is that the little girl is ignoring her mother on purpose because she’s upset about her father passing away. Scout can relate to this because her mother passed away and she may have hard times grasping this at times and may ignore her father while he tries to help her. In “Child and Her Mother” I see someone who is sad and disappointed. The mother does not see what her daughter is looking at ahead of the fence. It almost looks as if the girl wants to go beyond the fence and live her life. By the way the girl is hanging on the fence, it looks like she wants to just run away, but she knows that she can’t. Since the picture was taken during the Great Depression, to me it seems like the young girl might be wondering or sad about what is actually going on in the world at that time. Also, the girl’s mother is there but the father is not. In “To Kill a Mockingbird”, there are also parents missing just like the father is absent in this picture. For example Dill’s parents and also Burris Ewell’s parents are not in the story. In “To Kill a Mockingbird”, Scout has no mother and Atticus is always working. In the picture, the barbed wire resembles the Radleys’ white fence in “To Kill a Mockingbird.” Also, the fence keeps people wondering what is beyond it. In “To Kill a Mockingbird” Atticus doesn’t want his children going anywhere near the Radley house. The fence in the picture and in the story keeps people wondering what goes on inside the house and why. Also, I think that the fence is almost a form of protection. But, the fence seems to be holding people back from doing what they want. In Elizabeth Lesser’s speech, she talked about giving everyone a chance to explain him or herself and even if you disagree on topics, that doesn’t mean there isn’t parts about them you can understand and have in common. What Lesser discusses in her speech, is what the characters in To Kill a Mockingbird should follow. The characters are too quick to judge others who they don’t even know. They need to give them the chance to explain themselves before they make unnecessary and false claims. Scout, Jem, Dill, and most of the town think Boo Radley is a crazy young man who stares into peoples’ windows at night and tried to kill his parents, but they don’t know the real truth, only the claims made by people who judge him and don’t open up to him. Lesser gave a challenge to take the other to lunch, which is what everyone in To Kill a Mockingbird should do because they don’t seem to understand the people around them that aren’t in their family. Maria Theresa said, “The problem with the world is that we draw the circle of our family too small.” People don’t open up to others enough and let people close to them so they can get a chance to know them better, but instead judge others. I believe that you shouldn’t judge someone, at least negatively, until you can understand him or her. One of Elizabeth Lesser’s main points were to understand others; everyone has a different side to them that you haven’t seen. The people of Maycomb haven’t had the chance to see Boo Radley’s real side, or at least his other side, so they can’t understand him. People, including the characters, don’t open up to others enough to be able to understand the people around them. In the picture “Child and Her Mother,” there seems to be certain mood to this photo which is curiosity. The mother in this photograph seems to be curios at what could be troubling her young daughter while she seems to be staring off out of her confinement. The daughter herself seems to be isolated and must feel alone do to her depressed facial expression. However this expression might not only be due to simple depression, it might also be because of depression that no one accepts her and only show her prejudice. This reminded me specifically of Boo Radley in the novel “To Kill a Mockingbird.” Boo himself was strictly disciplined by his father and didn’t socialize with other kids his age. However I feel that Boo just wants to find someone he can relate to and be friends with after being isolated by his father. This photo also is relatable to Scout when she is being scolded by Ms. Caroline for already knowing how to read. Although scout and Ms. Caroline are not related, the emotions exhibited by both are highly similar to those of the child and mother in the photo. The same scowl given by Ms. Caroline is being adopted by the mother from the photo and the self-disappointment shown by Scout is also used by the child in the photo. However, I also see many differences in the photo such as the mother almost implies a sense of loving acceptance that is normally associated with the first thought of the title of “mother”. Also in the photo it is not definite that the child is being reprimanded like Scout is in the play, therefore I feel that my first perception of the photo and comparing it to the novel was closer to logical and the child resembles Boo’s emotional state more. 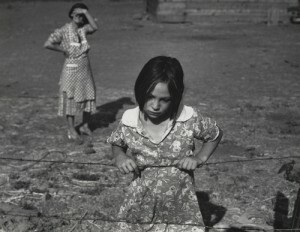 In the photo, “Child and Her Mother”, what I see is a young girl standing at a fence with her hands gripped around it. In the background, there is a woman, who is the young girl’s mother. I wonder why the girl looks so sad. Maybe it’s because her mother told her something she didn’t like, so she went to be a lone for a while. The girl looks somewhat like she is trapped behind the fence, wanting to get free but cant. In the background, her mother looks like she is trying to get her daughters attention, maybe because she wants to talk to her daughter about a problem or something, but her daughter doesn’t look she wants to be bothered at that time. I noticed that in the photo, the only two people that are present are the mother and her daughter, which leaves me wondering where is the girl’s father? This statement connects to, “To Kill a Mockingbird” and how Dill’s parents are “absent” within the novel. Also, the wire that the girl is holding onto could connect to the Radley family. To me, the wire indicates that whatever is on the opposite side of it, no one is allowed to go across. This is just like the Radley’s house. In the novel, everyone is curious as to what is beyond the Radley’s fence. They want to cross it to see what’s going on in the house but they know if they did, there will be consequences. The “Child and Her Mother” picture taken by Dorothea Lange stands out to me. When you first glance at the picture it’s a girl waiting by a fence, disappointed and looking at the ground. Her mother is in the background looking at what her child is doing or maybe she’s waiting as well. The mother is curious but also detached form her daughter, she is not smothering her asking what is wrong but is simply watching. This connects to the story when scout says “[Atticus] treated us with courteous detachment.” Atticus of course loved his children as any parent would just as this lady obviously loves her daughter but they are distanced from each other. Scout and her father aren’t as close as many other families are. For example, Scout and Jem call their dad by his first name, Atticus, and both children don’t share all their feelings with him and end up keeping it to themselves. This girl seems to be really upset and her mother seems “detached” from what’s going on in her life. She is being observant but not quite doing anything to make her daughter happier. On the other hand, maybe the girl wants to be alone because her back is completely facing her mother. Scout and Jem seem to be content with their dad’s “courteous detachment”. Sometimes Jem and Scout want their space to act out plays and what not and don’t want their father getting in their business. Although, the absence of Atticus does lead Jem, Scout, and Dill to do prohibited things like going to the Radley house. This little girl may want to rebel and do things she’s not suppose to. With her mother not there she may step out of her boundaries and go past the fence. This can lead to dangerous things. When you read the story “To Kill a Mockingbird” you wonder if the absence of parents affects children. Although Jem and Scout’s mom aren’t there they seem to be doing great. Scout is a smart, nice girl who learns to read before she started the first grade and has good intentions and hates breaking the rules (Going to the Radley house). Jem is a typical boy who wants to explore and hangout with his friends. The absent of their mother doesn’t seem to bother them but there father isn’t always a hundred percent involved with their life either. These children do a risky thing and try to talk to Boo Radley, which gets them shot at. Burris Ewell’s parents seem to also not be a hundred percent in his life. He’s a young boy who doesn’t bathe and has no intention on going to school. His absences of correct parenting lead him on the same cycle he is in now. Dill tends to be at the finch’s residence all summer and you start to wonder if his parent figure even cares that he is never home. Will the absence of parents affect these children in the long run? The detachment from this little girl’s mother may lead her down the wrong path. If this little girl doesn’t express her feelings properly with her absent parents and continues to be sad, will she go out side the boundaries and pass the fence to maybe become happy? Where will that lead her? I think that the most interesting paragraph out of the eight would have to be number 7. I especially like this one because of the imagery it involves and how detailed and constructed it is. You can picture in your mind a person crying and how you know that they were even if they don’t want to admit it. Not only does this paragraph show the emotions of Jem but it also shows that Jem cared a lot particularly about the tree. I believe that he was crying over the fact that Mr. Radley had poured cement in the hole of the tree. Jem knew that when the tree is sick you’re not supposed to pour cement but Mr. Radley did not want them in the tree and that’s the real reason why he poured cement in the tree hole. I think that this paragraph interests me the most out of any of these paragraphs because it’s a very strong paragraph, it shows how Jem was being very curios and how strong the family is because when Jem was standing there, he waited for him until Jem went inside himself. I also wonder how he never made a noise when he was crying because even when someone tries their hardest to not make a noise a little sniffle or a sob comes out whether they want to or not. Not only does Harper Lee show how emotions are such a vital part of our world on a day to day basis but also that many people hide their emotions to not hurt the ones around us. I chose to respond to “a child and her mother” because I feel it best represents the aspects of absent parenting in “To Kill a Mockingbird” and the curiosity the children feel about Boo and the Radley’s in general. I believe the picture represents the absent in parenting like in “To Kill a Mockingbird” because though you can see that the mother is clearly directing the child in a direction that is less treacherous than the one currently at hand it’s not very forceful or demanding. This is much like the parenting style of Atticus who states what he thinks what his children should and shouldn’t do, but that he will not force them to do so. Atticus just hopes that his children will simply follow through with his wishes his children will obey him because he’s their parent and obviously know what’s best for his children. This is much like the mother in the picture because even though she’s only a few feet from her daughter who is clearly not abiding to her wishes she stays were she is because perhaps she shares the same view point as Atticus and hopes eventually she’ll just listen to her because she knows what’s best for her. Though the picture also portrays how both the child in “a child and her mother” and the children in to “Kill a Mockingbird” share the same curiosity in what lays beyond their own restrictions despite how much it may risk their physical health to quench that curiosity and find out for themselves what lays beyond their limitations. In the picture this is portrayed by the girl grasping a hold of the barbed wires while in to “Kill a Mockingbird” it could be witnessed as Mr.Radley shoots into the yard when Jem and Scout shade sneaked out into the Radley’s yard to see Boo. In both cases it displays how the children ignore all fears because they’re potentially hypnotized by what they can’t or aren’t allowed to understand. In the photograph “a child and her mother” I see a young girl who is upset about something. The way that her mother is looking at her it seems like the mother is wondering what the daughter is sad about. One connection that I can make to the novel “To Kill a Mockingbird” is on page 29 when Atticus asks Scout if she is ready to read, and Scout remembering what her teacher had said walks to the front porch without answering her father. At this moment Atticus follows her wondering what is wrong, this seems similar to what is happening in the photograph to me. The two children also feel lonely, because they have a problem that they want to share but don’t know how to tell their parents. In the photograph the little girl is just with her mother and the father is nowhere to be seen, similar to the novel because scout is only with her father because her mother passed away. This makes me curious if the lack of their parents has anything to do with the problems that the children are having and why they are nervous or anxious to tell their parents. The overall theme of the connection that I made is the feeling of loneliness. The child in the image may feel lonely because of the facts she is scare that is going to lose something that she loved , because scout never loved reading until she feared that she would lose it, after all one does not love breathing. The chapter that ended the most interesting was chapter 1. Chapter one gave all the background information to know about the town of Maycomb. Near the end of chapter 1 is when Dill dared Jem to go touch the Radley House. Jem does goes and touches the side of the Radley house then ran back home. The last paragraph of the chapter gave what and how the house seemed to change after Jem touched it. Harper Lee gives a slight description of the house like by saying, “the old house was the same, droopy and sick.” Lee describes the house to be mostly the same but more of an edge to it. Using the words she did showed that the house lacked personality, was dark and secretive like the Radleys are themselves. I liked the words she chose though because, droopy kind of explained how if the house had feelings it might feel. Like how a flower wants water, the house wanted action and a better personality. It wishes to express itself more and not to seem so sad. The words, “droopy and sick” are words that will stick in your head whenever you think of the Radley house as you read more into the book. Then when Lee put in, “We thought we saw an inside shutter move. Flick. A tiny, almost invisible movement and the house was still,” she gave the reader another inside on the Radley family. How you don’t really notice what they do and how they act, but they move in small slight ways. Also that everything they do goes by like a flash, you miss their action. When Lee used “invisible movement” it made you really think about the family and the house again. Think about the saying, can there be a invisible movement? Or is it just saying the movement that was thought to be seen really didn’t happen, it was invisible. Also the slight move represented also Jems quick touch of the Radley House. That after he touched the house he tried to make small slight movements that would stand out to whoever was in the house. The last paragraph didn’t stand out by putting you on edge but by just really making you think again about what just happened in the first chapter. Lee used the details to make you really remember how scary the Radley house is described to be. Also, those last two sentences seem to want to make you think what could happen in the next few chapters of the book, and how character might react to certain actions. The photograph “Child and Her Mother” by Dorothea Lang and the novel To Kill a Mockingbird by Harper Lee have many connections. The picture portrays a mother who is standing quite a distance away from presumably her daughter. She appears to be quietly observing the young child. The school age girl is standing at a fence and looking off at a distance lost in thought. The appearance of the girl at the fence in the picture matches the description of one of the main characters in the story, “Scout” Finch. The girl is looking off in the distance just like Scout does in much of the opening chapters of the novel. Scout and her brother Jem (Jeremy) and their companion Charles Baker Harris observe the Radley house from a distance. The look of puzzlement on the young girl’s face about what is on the other side of the fence is similar to the curiosity that the children in the novel have about what is inside the Radley house. The fence is barring the young girl from investigating what is on the other side. Just like the children’s fear bars them from investigating what is inside the Radley house. The mother represents the relationship that the Scout and Jem have with their dad. His work keeps him physically from his children. Yet he is still a quiet observer of their actions. The mother is not hovering over the girl but allowing her to explore with some independence knowing that the fence will provide some type of safety net. Atticus Finch, the father in the novel, also gives the children some freedom to explore their surroundings but provides a safety net to them with his gentle guidance. Another way to look at this picture is to say the distance between the mother and the child is such that the mom is not really present for the daughter. This is highly symbolic since Scout Finch does not have a mom and her dad is a widower. The picture, “A Child and Her Mother,” is similar and different to the book, “To Kill a Mockingbird,” because one similarity it has is that the young girl in the picture is curious and wants to go beyond the wire. In the story Scout and Jem are curious about their neighbors the Radley’s and want to go past their yard to find out more. In both scenerios the expressions are the same. The girl looks very undecided on if she should go past the wire or not. In the story Jem gets dared to go touch the Radley house and at first he is hesitant about doing it and even undecided. Therefore the girl and Jem have the same emotions about doing something that they aren’t sure about. Also from Jem not going right away up to the Radley’s shows that he is scared but is trying to act tough around his friend Dil. The girl in the picture looks also scared because it looks like she doesn’t want to cross the wire. The woman in the background of the picture is staring at her and could of asked the girl to cross it. Like Jem, she could be trying to act brave but inside really scared. A difference is that in the story the parents are most of the time never around when the children are outside wondering around the yard or at the neighbors. In the picture them woman in the background looks to be like a guardian of the young girl watching out to see what she is doing. In the book Scout and Jem’s father is working a lot and doesn’t watch his children to see if they are staying in their yard. In the painting “Child and Her Mother,” I see a confused and depressed young girl who is leaning over a barbed wire fence, while an older women watches from the distance. I believe this connects to the novel through Scout and Mrs. Caroline. The woman in the back represents Mrs. Caroline watching over Scouts learning, while Scout, the young girl, is trying to get over her next “learning curve” in order to better her education. Scout wants to learn more by reading at home with her father however Mrs. Caroline won’t let her because she scared of Scout. The way Mrs. Caroline learned to be a teacher was to only let the student learn at school because parents teach the kids bad habits, however, scouts already learned too much from her father and is ahead of everyone else in the class. In the picture the older girl in the back is heavily watching over the younger one which is shown in the book when Mrs. Caroline is doing the same to Scout and her learning. Another thing is that in the picture it seems as if the young girl is forced to stay behind the fence because the older woman isn’t letting her. This is like Mrs. Caroline because she won’t let Scout learn anymore. Since Scout knows the majority of first grade material and Mrs. Caroline isn’t letting her read with her dad outside of school she can’t really move forward and better her education. A emotion of fear between both the novel and the picture is strongly present. You can sence the fear in the young girl not knowing what would happen if she goes over the fence. While in the novel Scout has a fear of what Mrs. Caroline will do if she “hops over the next wall of leaning” without her help. I found the ending to chapter 5 most interesting for several reasons. For one, we get to know a little bit better about Jem himself. It is noticeable through an argument between Jem and Atticus that Jem wanted to be like his father, a lawyer. Just from this we realize Jem admires his father even though we cannot see it in the beginning. Also, Jem starts to grow up and he realizes that he is no longer that little boy he used to be. Another reason why this is a good end to a chapter is because it is easy to see that see that Jem is changing. As Jem starts to grow up, he starts to become almost rebellious and more like a teenager. He is seeking more and more ways to get around things he doesn’t like. For example, when Jem decides to play the Boo Radley game and gets caught, instead of heeding his father’s silent advice, he just says, “Atticus didn’t say we couldn’t” (pg.54). Jem obviously used to see being a lawyer was this great thing and he had Atticus to thank for that. Now that this is going against him and he doesn’t like the rules, he changes his mind. He shouts after being played, “I thought I wanted to be a lawyer but now I ain’t so sure!” (pg.66). Not only does this focus on Jem, but this ending reaches out to many other kids Jem’s age. It speaks outside of the story and indirectly takes others problems into it. Many would agree that when they were younger, they thought the world of their parents, their role-models. As time goes by and life gets in the way, as it does to everyone, they change their ways. They find things that may look better or is played their way and by their rules. When it is time for the parents to lay down the law, they start to think differently. They think they know more and that the parents know nothing and don’t understand. In this end we see points of views that we wouldn’t normally see. Jem becomes more independent and tries to outsmart his dad. He does this by going around the problem instead of facing it. Atticus also starts to treat Jem the way he is acting and becoming more straight forward. Not only does this ending speak to people in general, but it especially speaks to me. As I look back now, I was just like Jem. Trying to start off on my own two feet and becoming more independent. I hated my parents when they disciplined me but now I know that it is for a reason, a good reason. I believe that even though Jem doesn’t see it as this now that he will in the future. Overall, we see a sudden change in Jem as a person and as a character. The main theme or moral of Elizabeth lesser’s speech is that it talks about how people should go out with someone who has opposing views and get to know them before judging them. In this she is saying that by going out and conversing with someone who might have different views from you, you get to hear that person’s interpretation of their opinion. You get to hear the reasoning behind their decisions. By doing this you can maybe even change the way you view something. Also, you can affect the other person by telling them how you feel. The main idea is, you can become a much better-rounded individual by getting to know different interpretations of something. Two people may have different views on a subject but they will never understand why if they don’t hear why they feel that way. In the novel, To Kill a Mockingbird, this concept of understanding why people act and think the way they don’t could come in very useful. One of the main motifs that comes up again and again in the novel is fear of the unknown, and this fear leads to skepticism and misunderstanding. For example, when Miss Caroline Fisher offers a quarter to Walter Cunningham and he denies the offer, Miss Fisher becomes offended because she doesn’t understand his situation. Walter belongs to a very poor family and he knows if he borrows the quarter he will never be able to pay her back. If only Miss Fisher talked to Walter and learnt why he didn’t want her money, the event wouldn’t have escalated. Another example where this idea would be helpful in the story is with the situation of Boo Radley. Most people in town are skeptical about Boo’s situation and no one seems to know what really happens with him. If people got to know him, or if he gave people the chance to know him, he might not be such a mysterious figure in the society. I chose to write about “Child and her Mother”. Dorothea Lange has recreated a moment that we all know to well, complete and utter sadness, almost depression. To me, it looks as if the mother has already said something to the daughter, to no avail, instead of silently observing her. I can make this connection to Scout. Scout wants to be a good student and believes she has mastered previous education. Scout and Ms. Caroline always have conflicts with one another, and Scout just wants to continue to learn. Another example is much more potent within the novel. Scout, Jem, Dill want to go and play with Boo, but Atticus Finch, there father acts like the barbed wire and refuses to let them play because it is none of their busniess. Atticus is always working in someway and Calpernia barely interacted with the kids, and no mother figure was present for these kids. Without a motherly roll-model Jem and Scout had to figure a few things out them selves with only fatherly discipline to help them. As a kid, I thought I was much smarter than my dad until I realized how wrong I was. Dad was always helping me out, but he was harsh on me. My mom balanced out the harshness to create a nice balance. Jem and Scout were not as lucky as me to have this balance. I slowly became more knowledgable and gained some independance. I am still gaining independence just like Jem is. I predict by the end of the novel Jem will become much more mature and will be able to make much more mature decisions. I found the message in Elizabeth Lesser’s speech to be very true and relatable to. The message Elizabeth delivered in her speech was that at this day in age, many stereotypes are being labeled on different groups of people and this is the roots of bad things to come. She explained that the “otherizing”, or labeling is the reason that bad groups such as the Nazi party were formed. She urged that stereotypes often lead to bad things and that was one example of it. This type of action against others is not a new thing. It has been happening for a long time and Lesser claimed that it is ruining society. In her message she urged anyone who had otherized someone else to do a certain task. She asked them to take the person from another group that they had otherized, and take them to lunch. This is where they could discuss the stereotypes about eachother and help end stereotypes against other groups of people. The message in Lesser’s speech also relates to To Kill a Mockingbird. It relates because in the story when Scout and Jem had Walter Cunningham over for dinner, Scout criticized Walter. Scout was ranting on about how Walter shouldn’t put molasses on his food because normal families don’t do that. Calpurnia then scolded Scout for offending Walter and telling him he can’t do something because his family is looked upon as one of the poorest in Maycomb. The moral of Lesser’s message is to not judge people by what they look like or what you have heard about them. The photo “Child and Her Mother,” taken by Dorthea Lange, the famous photographer of the “Migrant Mother” picture, shows a strong connection to the novel, “To Kill a Mockingbird,” with loneliness and segregation. The child seems to be fairly lonely because she’s the only kid out there and her mother is there but not doing much. In fact, it doesn’t seems like her mom seems to much to care at all because her child is gripped onto a barbed wire fence and she’s just watching. This reminds me of Burris Ewell because he is the kid who only goes to school on the first day and then leaves to do whatever Burris Ewell does. His parents don’t really seem to care whether he gets an education or not. So, the picture reminded me of the lack of attentive parenting the novel shares. The photo also shares the idea of segregation. The barbwire fence represents the separation or two things, obviously. The child seems to be torn by this separation. Kit almost looks like she wants to be on the other side. But more of the expression of she wants the fence gone. Her hands grabbing the fence give me the idea she’s angered with the fence, or she just doesn’t like it. The mom in the back has a certain pose to look her look, as if she is waiting. Maybe like in the old movies how the moms call out the kids for dinner and they come running in with their dog. The waiting also connects to the novel because Scout and Jem seem to be waiting for thongs to arrive in the tree, for school to be over, for the game of “Boo Radley” to continue. I chose option five because as soon as I saw it things began to run through my head. The image represents the great depression with the barren landscapes and dusty clothing. The child on the fence makes me think of Scout. She looks some what curious yet worried about what could be on the other side. I remember the story mentioning a fence around the Raddly’s house. So the fence in this image could be viewed as Scout peering into the Raddly’s yard. She wants to go, but the fence is preventing her from doing so. One thing I could do with this image is to replace the mother with ether Atticus or Jem. If it was Atticus it would be to make sure Scout was staying out of trouble. If it was Jem instead of the mother it could be him watching his sister curious on what she is doing at the border of the Raddly’s property. Something that I noticed when you look very carefully at the image is that the fence is actually barbed wire. Maybe the spikes on the wire can represent some form of pain or draw back in her mind. Scout does struggle with her teacher Mrs. Caroline Fisher when it comes to her advancement in reading. Maybe the tight grip on the sharp wire could be some form of a tie to her relationship with her teacher. The fence could also be seen as a metaphor for being controlled and confined to the boundaries of the class room. Another view from this image about school could be that Scout intimidates Mrs. Caroline Fisher. In the image the girl is in clear focus and is seen in front of the woman. The woman could be seen as Scout’s teacher. Having the girl appear larger then the woman, due to being so close to the camera, can show that she is more than Mrs. Caroline can handle. It is a possible out come also seeing as how she has a hand on her head. It is to block the sun in the image but could be portrayed as frustration. I chose to interpret the photograph “Child and Her Mother”. In this photo I see a young girl looking from the outside in. The girl looks as if she’s more disappointed on what is on her side of the barbed wire than what is on the opposite side. I can only imagine she sees a world better than her own. I can interpret that the other side is more put together because the young girl herself and the background doesn’t look lively. I would imagine grasping your hands on barbed wire would hurt but in the girl’s expression it looks like she could be used to it. The women, most likely her mother, in the background is looking at the girl. She doesn’t show much expression, she looks careless. The girl looks lonely and depressed as if she’s wishing for better things. I question why there’s barbed wire as a separation instead of a fence. In the story “To Kill A Mockingbird” a fence represents the separation from the Radley’s house. The Radley’s house is somewhat “evil” therefor the fence is protection. The barbed wire could be protection from evil also. I feel as if the mother understands the young girl’s interest on the world outside but she can’t do anything about it. I can interpret the fence in the book and the fence in the photograph both separate two different emotions. The Radley’s house and the girl are more negative than the other side. The famous photograph taken by Dorothea Lange, “Child and Her Mother”, has great representation of the novel “To Kill a Mockingbird”. When I first glanced at this picture I immediately felt sadness. The little girl about the age of 6 has the look of despair on her fragile face. A child of this age should have a grin full of happiness and laughter should be present a good 90% of the time. Instead she looks like she’s ready to burst into tears and the only thing holding her back is her focus on the pain going through her hands. The women in the background is the child’s mother and is looking over at her with the expression of confusion on her face. It also looks as if she is calling the child inside after a long day and when she see’s her grasping onto the fence she doesn’t know what to say. I think the reason for this is because of her absent parenting. However, she does not realize the lack of attention she’s been giving to her daughter and this is because she’s so caught up in her own schedule. This relates to “To Kill a Mockingbird” in numerous ways. One way I believe this photograph links to the novel is the absent parenting. For example, in the story Atticus is an extremely busy lawyer and since he’s so caught up in his work he gave the responsibility of his children Scout and Jem to other female figures around the house such as their cook. When the children make rebellious actions like when Jem runs up to the Radley house, Atticus is confused on to why his children would do such things. He most likely believes his children were raised perfectly, but little does he know that on the inside they are probably yearning for their father’s attention. Another example that I can use to contrast these to works is comparing Dill to the little girl. Though the girl has a mother and Dill doesn’t have any parents, she’s probably feeling as if she doesn’t have any either. The sadness within Dill doesn’t appear present to the children because he doesn’t talk about his parents much, but within him he is feeling the same emotions as the little girl grasping onto the barbed wire fence. The photograph “Child and her mother” by Dorothea Lange portrays a 1930s era arid landscape with a young girl as the focal point and her mother standing off in the distance. I say that the landscape is arid, because it quite literally is. The grass is dried up and straw-like, and the house in the background seems to have been lightened and dehydrated by the sun. The mood of this image is also arid. It is almost as if I can feel the dry rigidity and slight tension between the models. It seems as though the emotions of their relationship, along with the landscape have run dry. The main focal point of this image is a young girl, leaning on and clutching at a wire fence. She looks forlorn, or as if she felt she had nowhere else to go. I think that she is probably standing there because she has been disappointed, which exemplifies the disappointment, and hopes that were let down during the Great Depression. This young girl probably felt constricted by her times, wondering what her life would be like if she grew up somewhere else, in another time. Her mother, in the background, is slightly out of focus. I think that despite her posture and hand on her hip, that she is truly just as mystified as her daughter. This woman does not know what to do. She wonders if she should reprimand her daughter for hanging around so close to the boundaries, comfort her loneliness, or let her be. This reminds me of Atticus, and the time that Scout revealed that Miss Caroline commanded there shall be no more reading at home. Atticus stood on the porch, and twiddled with the plants for a few moments. He was deep in thought, wondering what to do with the situation. I think that despite the similarity of Atticus and this mother, that they are also different. I think that they both take the time to figure out what to do, but that Atticus is more decisive. He would make his decision, and stick to it. I feel as though the mother could possibly be influenced to change her mind often. All in all, parents are not perfect and often make mistakes, just as their children do. The minds of the parental figures in these items run dry, just as the landscape does. They run out of ideas, and have to think of new solutions. The response that I picked to respond to was the picture of the girl holding onto a fence, and what looks like her mother watching her in the background seeing what she could possibly be doing. The second I looked at this picture it instantly caught my attention jest because of the simple fact that it causes whoever is looking at it to think. The picture brings up a lot of curiosity when you’re looking at it because the way that photographer Dorothea Lange took the picture, what’s going on in it when she took it is not in any way apparent. You have to really think about all the possibilities for what is taking place. The viewer also has to take into consideration the time period and location at which this photo was taken, which was during the Great Depression. Just like in the novel “To Kill a Mockingbird”, the author puts things in the story to make the reader think about the purpose for why she incorporated that into her writing. Harper Lee, the author of this novel, puts in details to link certain parts of the story together, but instead of her just giving them to you straight, she provides them in a way where the reader has to almost decode what she is saying into their own words. For example, in the story Harper Lee incorporates a scene taking place at a school where a teacher becomes frustrated with a student named Scout for supposedly being too intelligent and exceeding everyone else’s education in the classroom. You have to wonder why she put in that scene in the novel. Was it to give a background on what school what like, how educated kids were back then, or to just incorporate a little more detail into the story. The photo and the story are also set relatively in the same time period (The Great Depression) leading me to possibly think that instead of that being the girls mom it could be a teacher and the kids are just outside for recess. I also can relate this to the story because there was a fence surrounding the school right where the Radley’s yard met the edge of the schools property which the children in the book including Jem, Dill, and Scout have gone up to numerous times. Nobody would dare go over the fence in the novel and as stated by the narrator, a ball into the Radley’s yard was a ball lost forever. As seen in the photo it looks as if the girl doesn’t want to go past the fence at all either or as if she is thinking about something deeply. That’s my interpretation of the picture and how it relates to the story. When I look at the photograph, “Child and Her Mother”, I see a time of the Great Depression. This photo shows a young girl standing against a wire fence as if she is in a mind state of sorrow or boredom. The way she looks down at the ground is as if she’s having something of a heatstroke or she’s just gotten news from her father or mother that they are either out of money or her father has lost her job. The mother overlooks her daughter as if she followed her through the field from the house to try and talk to the daughter but her daughter is in a state of rejection where she wants to be by herself. Another possibility of this picture could be the fact that the mother does not look in sorrow as her daughter does. So, the daughter could have just lost a friend to deprivation due to the great depression or could have even just gotten news about the family having to sell the house they live in to buy a more affordable one. These options are all possibilities that could lead to the reasoning for this photo. As I recall, the depression was a time of depression like this with many deaths, loss of strength in the economy, and a time of great desperation. This looks like a scene that has been repeated before in the daughter’s life, like this wire is her spot to rest and think to be calm. In “To Kill A Mockingbird” by Harper Lee, there is a white picket fence around the Radley’s house that many of the kid’s want to explore past to see the Radley’s house but they can’t because of Atticus. This fence is much like the one at the Radleys because not only does it hold kids back, but also it steers them away from going past it like the daughter wants to do in this picture. “Child and Her Mother” depicts as the title describes, a child and her apparent mother. There is the possibility of course to have multiple reasons for this photograph to have be taken, however I feel that the main reason would occur within the depth of the photo. As shown, the daughter is up close holding onto a fence made of barbed wire. However, the mother is farther back in the shot and not as visible. This I feel depicts the emotions in the photo. The photographer Dorothea Lange shows the girl as being ‘depressed’ in the sense that she is facing down with a frown on her face, and is holding onto the barbed wire loosely. Meanwhile, the mother is in the distance covering her face most likely from the sun, but possibly also to draw the audience’s attention towards the girl. I also noticed the absence of a father figure in the photograph. This could lead to why the child is depressed, but it can also be connected to the novel “To Kill a Mockingbird” because of how in the book Dill’s parents are absent, just like the father in the photo. Dill has shown the want/need for a father figure, and the child in the photo may also have the urge for an adult companion as in a father. I can also connect the novel to the picture because of the barbed wire that is shown in the photograph. The girl holds onto it loosely, possibly wondering what could be beyond it. This can be connected to the Radley’s house when it is forbidden to go across. People may wonder what is on the other side, however they cannot find out because of how it is not allowed. The child in the photo may be wondering the same thing, and realize that she cannot travel to the other side of the wire for the fear and danger that may come with it. Wisdom is present in “to kill a mocking bird” in many way but it is also absent in many places and by characters. Atticus shows his wisdom to his children in many ways one of which is when scout asks if they are poor like the Cunningham’s. Atticus has a wise response that will not make scout think that they are better than the Cunningham’s he tells her that the stock market crash affected every one and that they were poor but not the same way as the Cunningham’s. the way that Atticus explained how they were also poor let scout know that they weren’t better than the Cunningham’s but still answered the question. Atticus has many wise thoughts in this book and the majority of them are directed at his children in an effort to make them feel the same as those who struggle. Wisdom is also absent throughout the book and comes in and out as the book goes on like when miss Caroline tells scout that it is not good that she already knows how to read and write which is not wise because it hurts how scout likes to learn showing that she is not a wise teacher. Wisdom is at the heart of this novel because without wisdom the book wouldn’t be the same and it is the wisdom of Atticus that helped scout and jem to become who they are without making them think that they are better than the rest of the town because they have more money. Also without wisdom it would be a whole different book and eliminate motifs such as absent parents. I chose the photo because it looks the easiest. IT shows how depressing the depression was. The girl is grabbing barb wire and doesnt care because she is so down. Her mother is just looking at her. It shows dpression liek how in chapter 2 of “To kill a mockingbird” Walter has no money and declines ms.carolines offer of a quarter for lunch and just looks down and sad.